Do you have constant pain in your tooth? If you can’t see the cause for the discomfort, you could have a tooth infection. This can develop when normal bacteria in the mouth manage to work their way deep into the tooth to begin actively decaying the enamel. A nerve within the tooth, which is also referred to as the pulp, will start to hurt to alert you to the damage! This pain can only be relieved with an extraction or with a root canal. Fortunately for patients of Homer Glen and nearby areas, Dr. Alan R. DeAngelo performs root canals at his Homer Glen dental office! Call us today if you think that you have an infected tooth. Because the damage is occurring deep within the layers of enamel, the only way to reach the area to flush out the bacteria and apply antibiotic is to perform a root canal. Dr. DeAngelo is able to carry out this restorative service with dental lasers, which let him reach the interior of the roots without risking damage to the entire tooth structure at his Homer Glen dentist office. Once the germs are flushed out, we’ll fill the tooth with a tooth-colored composite, and we may cap off the area with a dental crown to restore the look of a natural pearly white and to prevent the bacteria from returning to the area. Dr. Alan R. DeAngelo provides this endodontic service to patients as a last resort, and will only perform root canals to those patients who would benefit from this procedure. If you have any questions, we encourage you to ask them during the appointment. 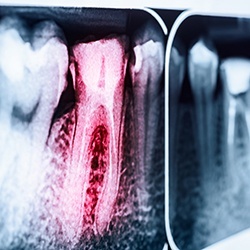 Patients who have an infected tooth and who decide against root canal therapy are putting other teeth and even their jaw bone at risk for further infection. Additionally, the pain will continue without endodontic therapy from our Homer Glen practice. The only other option is extraction, which can put patients at risk for alignment troubles as well as the embarrassment of an incomplete smile. Skilled Homer Glen dentist Dr. Alan R. DeAngelo can explain the enormous benefits of having a root canal and help you work through any misgivings you may have. Our entire team wants to help you preserve the beauty of your smile as you recover your overall dental health.